Cover photo: Waiting for the road at Leeds. 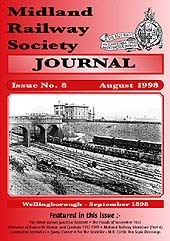 Kirtley ‘800’ class 2-4-0 No.816 pilots an unidetified Johnson 7ft ‘60’ class 4-4-0 on the Bath and West of England Mail around the turn of the century. Rear cover: The timings of a Directors' tour of the branch lines in the West of England and South Wales in July 1872. At this time several of the lines were not in pure Midland ownership, being either worked or leased. The overnight visit to Swansea is interesting and may well have involved preliminary discussions on the absorption of the Swansea Vale Railway into the Midland system. The Great Western Railway’s station at Swansea Wind Street - from where the party returned - was actually closed to passengers in March of the following year. Rear cover: An unusual card printed in connection with an early excursion on the Midland. Its route from Ilkeston to Sheffield would probably have been via Long Eaton junction (reverse), Derby North Curve, Ambergate, Chesterfield, and Masborough (reverse). The junction with the MS&L line at Beighton opened in February 1849, so it is just possible the the train used this more direct route to Shefflied Bridgehousees instead. 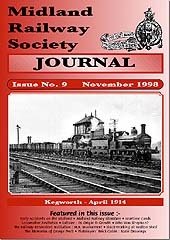 Cover photo: Two Johnson 2Fs haul an 82 wagon London-bound coal train past Kegworth signalbox on 1st April 1914. The leading loco is 3552, which was built by Sharp Stewart & Co. as 2266 in 1897, while the train loco is 2904. This was built by Kitson & Co. as 1146 in 1875. The newer loco was only in service until 1935, but the older one worked for over 80 years, being withdrawn as 58117 in June 1956. Rear cover: A postcard sent from the Secretary’s Office to Lance Corporal W.J. Strutt for Christmas 1918 congratulates him and his colleagues on their victory. Cards depicting the arrangements both before and after this occaision are illustrated on page 8.